Folders Galore have developed Real Estate Brochure Holders to complement the exisiting signage that Agents place outside their houses for sale. The brochure holder is designed to hold the sales fact sheet, protecting it from the elements and providing immediate 24/7 access for potential buyers. This is a smart way to maximise Agents advertising. 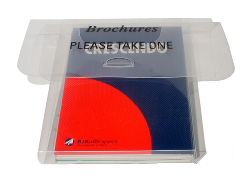 Brochure holders come in A4 and A5 sizes, are clear and may be foiled or embossed with the branding of the Agent. Customised Box - Marketing, Presentation and Conference Applications. Made from durable polypropylene which can be screen printed with your branding and other information. These boxes can be ordered in a variety of shapes and sizes to suit your needs - not just as Real Estate Brochure Holders, but now as a customised box. As a branded product these boxes 'stand out' from the crowd. Used by many corporate organisations at their conferences for delegates to store information and popular with today's designers as a packaging medium for their clients. Storage Applications. Using the same materials but unbranded this is a storage and archiving medium, copy safe and durable file size envelopes or boxes can be made for long term storage - this form of storage does not rip or tear and will last indefinately.